This view from a camera aboard the shuttle Discovery shows the International Space Station just before the two spacecraft docked on Aug. 30, 2009 high above the Atlantic Ocean. Thisstory was updated at 12:33 a.m. EDT. After atwo-day orbital chase, space shuttle Discovery linked up with the InternationalSpace Station late Sunday to deliver a new crewmember and a cargo pod full ofvital supplies. Discoverycommander Rick Sturckow docked the 100-ton shuttle with the spacestation as both spacecraft flew more than 200 miles (341 km) above theAtlantic Ocean. ?It?s greatto hear your voices,? station astronaut Michael Barratt radioed Discovery?screw as the twospacecraft drew close. ?We can?t wait to see you.? Sturckowflew Discovery without the aid of six small thrusters, which are usuallyextensively used during docking, because one had a leak. Instead, he usedDiscovery?s larger, more powerful thrusters, which use more propellant and canmake for a louder ride and more challenging docking. ?He justflew it like a champ today,? shuttle flight director Tony Ceccacci toldreporters after docking. Sturckowhas trained to use the larger thrusters during docking, but NASA never had totry it until today, Cain said. The smaller thrusters will not be used for theduration of Discovery?s 13-daymission, he added. Sturckow also had to compensate for a slightmisalignment of the space station, which was 1 degree out of position duringtonight?s docking, NASA officials said. Beforedocking at the space station, Sturckow flew Discovery through an orbital backflip so station astronauts could photograph the shuttle?s tile-covered belly ina routine heat shield check. Analysts on Earth will review the images once theyare sent to Mission Control. Discoverydocked at the station about 10 minutes early at 8:54 p.m. EDT (0054 Aug. 31GMT). Hatches between Discovery and the space station opened just over 90minutes later with the seven shuttle astronauts boosting the station?ssix-person crew up to 13 people - a record-tying high - for only the secondtime. Discoverylaunched toward the space station late Friday carrying a cargo pod packed withabout 15,200 pounds (6,894 kg) of new science gear and a treadmill namedafter televisioncomedian Stephen Colbert. Colbertrallied fans of his Comedy Central show ?The Colbert Report? to help him winnaming rights for a new space station room during an online NASA poll earlierthis year. But NASA named the module Tranquility instead. As a consolationprize, NASA named the new treadmill the Combined Operational Load BearingExternal Resistance Treadmill, or COLBERT. Discovery is also ferrying NASA astronautNicole Stott to the space station to begin a three-month mission aboard theorbiting laboratory. She will replace fellow spaceflyer Tim Kopra, who haslived on the station for more than a month and will return home onDiscovery. EarlierSunday, Stott sent her 7-year-old son Roman ?ginormous thanks? and ?big spacehugs? after he sent her a long-distance dedication as a wake up call. ?I justwant to let him know that I love him more than anything,? Stott said. Discoveryand its crew will spend just over a week linked to the space station to movethe nearly 8 tons of cargo to the orbiting laboratory. Three spacewalks areplanned during the mission to replace an ammonia coolant tank as massive as asmall car and perform other upgrades and maintenance. Deputyshuttle program manager LeRoy Cain told reporters Sunday that an early reviewof data from an inspection of Discovery?s heat shield by astronauts has foundthe shuttle in good health. A final analysis of the inspection data and imagerycollected during Sunday?s docking should be completed in the next few days, headded. 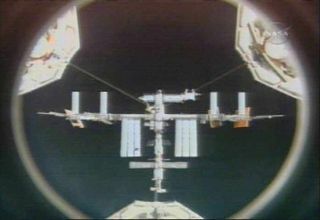 Discoverydocked at the space station on the 25th anniversary of its maiden launch onAug. 30, 1984. That mission, STS-41-D, deployed three satellites and testedsolar array technology for a future space station.